See it there? In the middle of the wall? 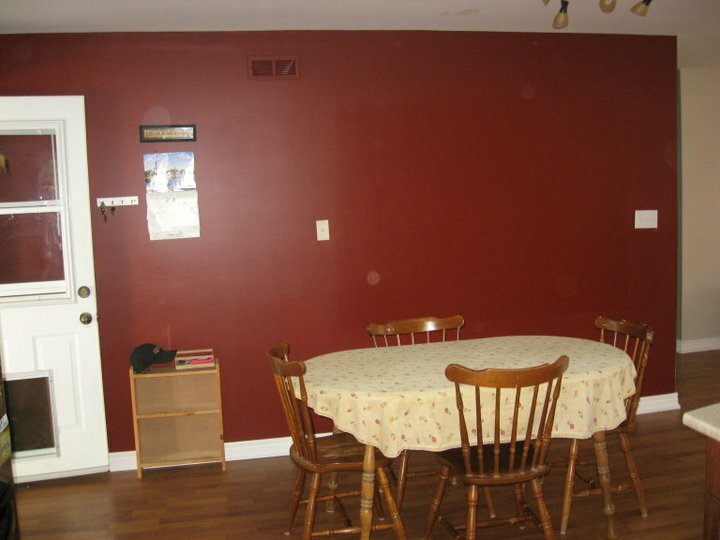 The previous owners had their phone mounted to the dining room wall and that worked fine for them. Not so much for me. I don't want my phone there and I found the phone jack to be an eyesore. It bugged me and felt out of place. I put up with it for over a year but finally decided it was time for it to go down. We had more red paint and were planning on repainting the whole wall anyways. So we asked our electrician friend to move it down for us. He came over for lunch one Sunday and after we were finished, he set to work. He would have to make the hole slightly bigger in order to get the jack out. No big deal right? He quickly moved it down and I was feeling pretty good about how easy and speedy this whole process was going. That feeling didn't last for long though. It all came to a screeching halt when Dan decided that this was the perfect opportunity to put that second shower head and valve in our shower that he has always wanted. You see, our bathroom is just on the other side of that wall. So Dan's theory was, there's already a hole in the wall, why not make it bigger? So he got to cutting while I cried silently in the background. And pretty soon, this is what my previously tiny hole looked like. Now unfortunately for you, I have no more pictures of the hole and how big it actually ended up. After this above picture was taken, I set to work preparing supper and cleaning up the kitchen for our guests that were supposed to arrive in 2 hours time. I was trying not to be mad at the huge hole in my wall or the fact that I didn't even want this second shower head to begin with or how my friends had never seen our house and now it was a giant mess. I just cringed every time the hole got bigger. You see, first there was a stud in the way so it got bigger. Then Dan decided that since we were this far, why not make it bigger and fish some wires from the attic into the basement. In the end, I had a 6'x2' hole right behind my dining room table. The next stage was taping, mudding and sanding. Which took a couple weeks since we didn't work on it faithfully. So I got to stare at this for a few weeks. Don't worry though, this post has a happy ending! I came home from work last Friday to be surprised by this! Ignore the crappy quality of the picture and just focus on the beautiful red wall! With no more giant hole in it! Dan spent the day finishing up the sanding and painted it in time for me to come home. I was so happy! Especially since it meant I could get that coat rack hung and start using it. This whole experience taught me patience and that a hole in the wall doesn't ruin good times with friends. But I am happy to have my wall back. our living room has almost the same color walls, I'd be distraught over a hole! =) it came out beautiful in the end though, and the coatrack is AWESOME!